Whether you’re building a new home or renovating, it is important to know exactly what energy saving upgrades will have the biggest impact. A Home Energy Assessment will help you determine the overall energy efficiency, or EnerGuide Rating of your home, allowing you to make informed decisions about which upgrades you choose to invest in. A Home Energy Assessment shows you, and future owners, just how energy efficient your home is. 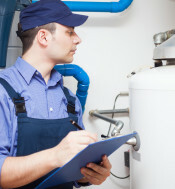 An assessment is also required to access many of the incentives and rebates available to homeowners for energy upgrades. Additionally, when the assessment is completed, you’ll receive an official NRCan Label confirming the rating. Should you sell your home, this is proof that it was tested and rated by a licensed Energy Advisor. What to expect from MJM? With our partners, Sustainable Housing, we’ll start the assessment by sitting down with you to explain the entire process. After all of your questions and concerns have been answered, we’ll walk through your home, inside and out, assessing everything from the basement, attic, exterior walls and heating system, just to name a few. Usually this takes about 2 or 3 hours total, depending on the size of your home of course. After the assessment is complete we’ll sit down with you once more to review our findings and advise you on which energy upgrades offer the greatest return on investment and what rebates you could be eligible for through Efficiency Nova Scotia’s rebate programs. All of our Energy Advisers are properly licensed by Natural Resources Canada and highly trained professionals with extensive knowledge of the newest technologies and building practises to reduce energy consumption.